If you’ve been looking for the most professional kitchen benchtop manufacturers Sydney to offer then it’s time to give us a call. Our kitchen benchtop stone masons are fully licensed and consistently build kitchen benchtops which exceed our customer’s expectations in both quality & affordability. We construct kitchen benchtops that are a perfect fit which match our valued customers’ needs precisely. Our kitchen benchtops have a myriad of designs to choose from and there’s bound to be one that perfectly suits your needs. We can also custom design a kitchen benchtop for you if the available space on your kitchen is an irregular shape. 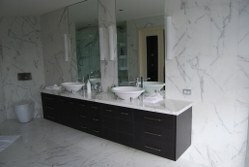 DD Stone always provides its clients with a stress free and fast in-house build-up process. By utilising our fast kitchen benchtop build process you can cut days of the construction of your kitchen benchtop and be reaping the rewards much sooner. Our main goal is to help you realise your needs and to minimise expenses so you can get the most out of your dollar. Unlike other kitchen benchtop manufacturers, we have forged connections with Australian suppliers so that we can buy quality materials at wholesale rates. It’s because we’re able to get all of our materials at highly discounted prices that we can pass on those savings to our kitchen Benchtop clientele. This enables you to save money and gives you access to the most affordable kitchen benchtops packages available in the Sydney area. CALL us for Affordable Kitchen Benchtop Packages!!! We know that you value practicality and comfort and would like to build a kitchen benchtop that utilises every possible inch of your limited kitchen space. We also understand your need to impose your personal preferences as well. That is why our plans have modern arrangements that can easily be modified to suit your kitchen benchtop design tastes. We also design our plans to be modular so that you can customise your kitchen benchtop design exactly the way you want it. Consider kitchen benchtop as an investment. Beautifully built kitchen benchtop does increase the value of the property. Also when the property is on the market for sale, the two most important aspect of potential buyers are kitchen benchtop and bathroom area. Even if the property is not in the market for sale, renovated kitchen benchtop will give you the full satisfaction whenever you are preparing your meals three times a day. By completing the kitchen benchtop in such a short timeframe, you will enjoy the new kitchen benchtop in no time. Second, make a 40% progress payment and, if the approval is required, the professional fees so that we can commence work to process the CDC. © 2013 Copyright DDStone. All Rights Reserved.